The ANC government has been turning a blind eye to the revitalisation of the township economy for the longest time. Our township economy continues to reflect the legacy of the apartheid, where cheap black labour is reserved for the industrial sector in the cities – initially in the mining sector and in now also in the rector. Globalised capitalism and local monopoly capitalism is entrenched in the townships. This is best represented by shopping malls. It is ironic that with our high inequality, poverty and unemployment our country also has a higher number of shopping centres than the United Kingdom, our country has about 1 750 shopping centre while the much wealthier United Kingdom has about 1000. Our country has no control over how global capitalism impacts the lives of our citizens. Capitalism has been entrenched in South Africa since 1980s when apartheid government introduced its neo-liberal policies. In 1996 the ANC government, through a class project by former Trade and Industry Minister Trevor Manuel, reached agreement with World Trade Organisation (WTO) that the WTO must regulate our tariffs imports from Europe and the US. Unlike other global South countries South Africa voluntarily adopted this structural adjustment policy of trade liberation and financialisation of our market. Former president Thabo Mbeki justified this decision by arguing that he adopted a neo-liberalism economic framework to settle the country’s international debt. The government, in an unholy trinity with the WTO and World Bank, reached an agreement which resulted in the deindustrialisation of South Africa’s local economy and the cementing of the global market’s hegemonic power to determine South Africa’s maize and breads prices. Noting that the apartheid government used to have Maize Boards whereby they regulated maize prices without global forces. Today the South African maize price is determined global forces in Chicago. Our government’s agreement with the WTO subsequently led to key sectors deindustrialising such as textiles, clothing and electronics. This can also be attributed to delay of the economic transformation of townships since the 1994 democratic breakthrough. Our dilapidated townships continue to reflect the reality of life for the black working class and the poor. They exist in the permanent vacation of consuming without producing anything due to lack of employment and industrialisation. However, the Gauteng government led by young and vibrant ANC leaders came to the fore with a progressive plan to revitalise the township economy. It is plausible that the Gauteng government through the MEC for Economic Development, Lebogang Maile, initiated the revitalization of the township economies project. 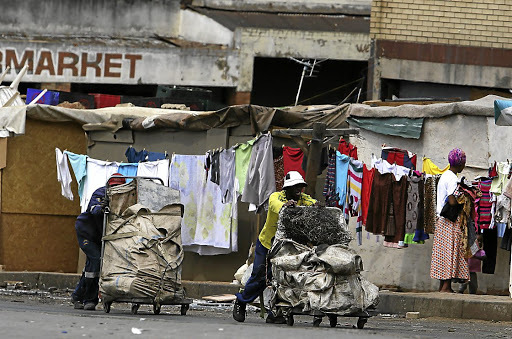 The township economy emerged as the direct response to poverty, inequality and unemployment. Let’s acknowledge the fact that Gauteng’s provincial government interventions into township economy came as an attempt to address consequences of capitalism entrenched by the Thabo Mbeki administration. The Gauteng township economy project seeks to build inclusive economy and alleviate poverty and inequality in Gauteng. Since the inception of this project, Gauteng government has been playing significant role in building township economy. Today, Gauteng has 14 registered co-operative banking institutions serving over 16,000 member-owners, with over R100 million in savings and R150 million in assets. This is a commendable intervention to deal with the negative impacts of neo-liberalism economy. Stokvels have long existed in South Africa. Their origin can be traced to the colonial and apartheid regimes which marginalised black South Africans and excluded them from the mainstream economy. The fact of the matter is that stokvels appeared in the black communities so that black people could survive the economic and social oppression imposed on them by the apartheid system and buttressed by racial, class and gender exploitation. Conversely, the first component of Stokvel was the Bantu Burial Society formed in 1932. Our ANC government must unbundle the economy, by bringing Stokvels and burial societies into the mainstream economy. This will automatically revitalise the township economy. The township economy must be revived by boosting the stokvels, and then those participating in stokvels must also purchase the locally produced products. In the post-apartheid, stokvels are considered informal organisations by the banking sector, although they are governed by a set of rules and principles through their members. These capitalist driven stereotypes behind stokvels continue to exist in our townships and rural areas in order to downplay township economy. The stokvels have and continue to keep the finances of black people, especially the striving working class, afloat because they create social economy where black people can collectively save their money and buy each other groceries at the certain time of the year or pay out money invested to members instead. Stokvels contribute to the economy of our country. Our government must begin to assess the ways in which they can penetrate the Stokvel industry and grow it to eventually be incorporated into the mainstream economy. Over the years Stokvels in our country have been growing phenomenally. Stokvels also seriously contribute to community development and local economic growth in several ways: such as the creation of employment and micro businesses. In other words, stokvels strongly contribute to the promotion of financial capital, social capital and social cohesion. On the other hand, they also significantly serve the market—they are reported contribute about R45 billion to the economy. Our government must fully capitalise on and invest in township economies to eradicate poverty. It is estimated that there are 800 000 stokvel groups with 11 million individual members. Gauteng standing at 24% of the people engaging in stokvels (see figure 1). Gauteng has the largest townships in South Africa the combination of Soweto, Tembisa and Katlehong has almost 2 million people. This was the data below was collected by National of Stokvel Association of South Africa. The Old Mutual Savings and Investment Monitor Annual Survey embarked on the task of contacting black Africa households about their investments. In 2016 they reveal the fact that the Stokvel sector’s economic estimated economic share has increased to R49 billion in savings and 8% of them, which is about R8.8 billion, were formed for buying groceries. Again, the Old Mutual Annual Survey Report in 2016 further showed that usage of Stokvels in South Africa by black households has increased from 50% in 2010 to 59% in 2016. As a consequence, there are different types of Stokvels. Topping the list of types of stokvels that black household members belonged to in 2016 were the Burial Stokvel at 34%, followed by the Grocery Stokvels at 18%. At the same time, these stokvels and burial societies consume global products such as groceries produced by multinational companies. The ANC government, in line with their 54th National Elective Conference, adopted the Radical-Socio Economic Transformation. The revitalization of the township economy is very important and Stokvels and burial societies are central to boosting this development. The ANC must also revitalise the township economy in order to solidify transformation of the economy for black people. Consequently, our government must revisit the Friendly Society Act of 1956 and Bank Act of 1990. This was the strategic framework put together by the apartheid and capitalism relations government because they wanted burial societies to work in a way which would benefit the apartheid financial institutions such as banks. Burial societies are supposed to open an account with a bank and they were not allowed to accumulate money without banking it. As well, the Bank Act recognises stokvels within a legal entity, and place limits to the maximum level of deposits for a Stokvel to R9.99 million. The ANC government must adopt the bottom-up approach in dealing with economic transformation. If it is serious about the call for radical economic transformation they must start by amending Friendly Society Act of 1956 and Bank Act of 1990. This will allow small scale burial societies to open accounts with banks. Currently, many burial societies open bank accounts as cooperatives and some keep their money under mattresses – a seemingly comical idea but a real consequence of structural economic exclusion. Still today these financial Acts benefit only big banks such as FNB, Standard Bank, Absa etc. The state must attempt to eradicate these laws which work in favour of monopoly capitalism through forcing burial societies to work with banks and giving banks the ability to put a restriction of amount of money stokvels accounts can hold. Our government must continue to buffer the Cooperative Act of 2005 and amend the National Credit Act of 2006 because this Act puts limits on the interest rates for loans, which currently stand at 32% per annum. As it currently stands, the phenomena of Stokvels are considered informal financial structures (the majority of them) and impossible to apply the National Credit Act to these stokvels. Our government must clearly scrutinise these laws in order to make them work in favour of the stokvels directly and the broader township economies as a consequence. There is no clear Act which governs the stokvels but they are regulated by National of Skovel Association of South Africa and the apartheid Bank Act of 1990. This is troubling because, post the-apartheid regime, our government has not paid enough attention in the development of stokvels. National Stokvel Association of South Africa is the mobilising group of stokvels and it is only authorised by the Reserve Bank. I have argued several times that stokvels must have a direct legislation outside of National Stokvel Association of South Africa that will allow them to have a strong legal basis to function. In 2004 the South African Communist Party (SACP) made a critical call to the Financial Sector Campaign Coalition (FSCC) and SAFOBS. These are entities created to enhance the regulation of burial societies mostly in the townships. The General Secretary of the SACP Blade Nzimande, in his address on 16 October 2004 at Johannesburg City Hall, called upon SAFOBS and FSCC to ensure that burial societies can deal with banks on the basis of the needs and interests of members of burial societies and not based on profits for banks. The SACP must revive and intensify the FSCC and the call for our government to establish the state bank that will only focus on township economy. This bank must solely focus on stokvels and burial societies. It must push our government to assess the cooperative, because 85% of cooperatives funded by state failed while our government has already spent around R1billion on cooperatives. Our government must strategically boost the township economy by boosting stokvels. This can happen in a variety of ways, the first leading back to the perpetual debate that our government must establish a state bank. Studying the economic development of Britain, one will see that British government was controlling their banks. This is not dissimilar to the National Party 1989 resolution to nationalise the reserve bank and the ANC elective conference 2017 resolutions that the party must further take a steps to nationalise South Africa’s reserve bank. Clearly, with a state bank and the nationalisation of the reserve bank, our people can afford to make their banking transactions cheaper contrary to the status quo where in 2004 Standard Bank alone was taking, through bank charges, about 6 cents for every deposit made by each member of more than 50 000 members. This comes to close R300 000 per month. It is troubling that in post-apartheid black people continue to be financial enslaved by banks. Figure 7, shows that stokvels, which are predominated by black working class and the poor benefit, South Africa’s financial institutions. The Post Office through the Postbank, a state financial institution, holds a higher ratio of stokvel accounts than any other bank except Nedbank. The government must revive the Post Office and boost township economy by encouraging the stokvels and burial societies to bank with them. However, the Post-Office must be treated as the workers and community bank. The Post-Office must not be involved in the mainstream speculative markets of the financial sector. A good example of this is the Northern Province of Italy, which did not engage in financial markets, hence the 2008 bubble burst did not affect Northern Province of Italy. Surely there is a need for a combat strategy to replace the capitalist model, especially in the financial sector and agricultural sector. And it is fundamentally essential for the land issue to be resolved in line with rebuilding the South African manufacturing sector. So that most of the food purchased by South Africans can be manufactured or processed in our country. The ANC, during its watershed 2017 elective conference, resolved for the expropriation of land without compensation. As former Chinese President Mao Zedong pointed that “a revolution is not the same as inviting people to dinner.” If the ANC is serious about Radical Socio-Economic Transformation, then they must use the Industrial Development and Corporation (IDC) and Land Bank to strongly fund black farms. Local food production must be supported to boost our food security and reclaim our food sovereignty from global North countries. Legislature needs to be developed create strong cooperatives. Let’s pause and check the facts, grocery stokvels contributes a lot to our economy. For example, Shoprite (69.9%), Pick ‘n Pay (49.2%) and Spar (32.9%) are the three main retail outlets used by individuals for their grocery purchases. When it comes to shopping for the stokvel, this varies slightly with the top 3 outlets being independent wholesalers (23.3%), Shoprite (20.7%) and Spar (10.6%). If these groceries are purchased locally the township economy, for instance in retail consumer cooperatives, these can rapidly revitalise our township economic. Therefore, the consumer cooperative appears more significant to the sale and supply of the local food to the Stokvel members. Given that the primary challenge faced by stokvels is the lack of transport; our government must supplement the members of Stokvels buying at local cooperatives with transport to deliver. Our society is confronted with enormous social and economic challenges which can partially be resolved by revitalising the township economy through boosting stokvels and burial societies. Our nation needs an urgent solution to address three oppressions; poverty, unemployment and inequality. Again, boosting stokvels and burial societies can help to deal with some of these challenges. Stokvels will then start prioritising the township based shops and consumer cooperatives retails as their primary supplier for groceries. The ANC government must critically attempt to assist black people to revitalise their local economies by helping them to integrate the local economy into the mainstream economy. This might also improve their living conditions and create job opportunities. Ultimately, our government will be minimizing social and economic problems such as inequality, unemployment and poverty among black people.